ESSEX – J.T. Dulany has been pinned down more times than he can remember. Competing mostly in the 103-pound weight class throughout his four years at Our Lady of Mount Carmel High School in Essex, the 19-year-old varsity wrestler said it took opponents an average of one minute to press his shoulders to the mat. “My strategy was to pray to God that they didn’t beat me up that bad,” Dulany remembered with a laugh. His joke belied a fighting spirit. 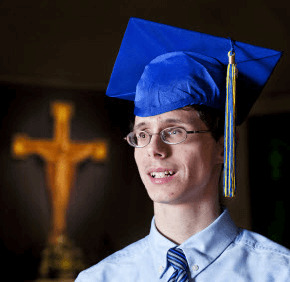 Legally blind since his premature birth, Dulany underwent seven eye surgeries before he was 2. He has a mild form of autism known as Asperger’s syndrome and had to face the death of his mother in 2006 to kidney failure. The challenges have only made Dulany stronger. With a 4.4 senior GPA and a cumulative 4.19 GPA, Dulany delivered the valedictorian address at his June 1 graduation ceremony. Throughout his wrestling career, Dulany made use of special rules for people with visual impairments that allow for constant touch with his opponents. He lost every match he fought – except for one in his junior year against an Edgewood High School student that became the stuff of legend at Mount Carmel. Mike Naunton, Mount Carmel’s athletic director, remembered that after the match’s first period, Dulany scored a few points. It began to look like the long-suffering wrestler might actually win. Fans burst into joy, a scene fit for the silver screen. Grant Taylor, a 17-year-old junior and captain of the wrestling team, remembered jumping up and down over his friend’s only victory. “I almost cried because it was just so great,” Taylor said. Dulany’s enthusiasm is reflected in everything he does, Taylor said. Naunton said Dulany’s peers support him. When Dulany tried out for junior varsity soccer, the other athletes zoomed past him on a timed run. Left behind and unable to see the route the other students had taken, Dulany got lost. Dulany, whose full name is “James Theodore,” was recognized as one of the Archdiocese of Baltimore’s Distinctive Scholars. He’s been active as the treasurer of his school’s National Honor Society and a representative in the Student Government Association. Asked what motivated him, Dulany said he wanted to make history at Mount Carmel. Being one of the first four-year wrestlers in the school’s existence was his way of doing it. Faith gets him through the struggles of his life, said the parishioner of St. Michael the Archangel, Overlea. Dulany has a special devotion to the Blessed Virgin Mary. Connie Flagg, one of Dulany’s favorite teachers, said Dulany is one of the most memorable students she has ever taught. Dulany will attend Loyola University Maryland in the fall, majoring in political science with plans of going on to law school. He knows his father is proud of his accomplishments – and his mother is, too. “I’m pretty sure when you go up to heaven, my mom would be shunned from the angels because she’s already bragging so much,” Dulany said.